Now that the 1786 floor of the Lower Market has been almost entirely removed, the archaeologist are slowing digging into the layers of the the era of the American Revolution and the late colonial period. 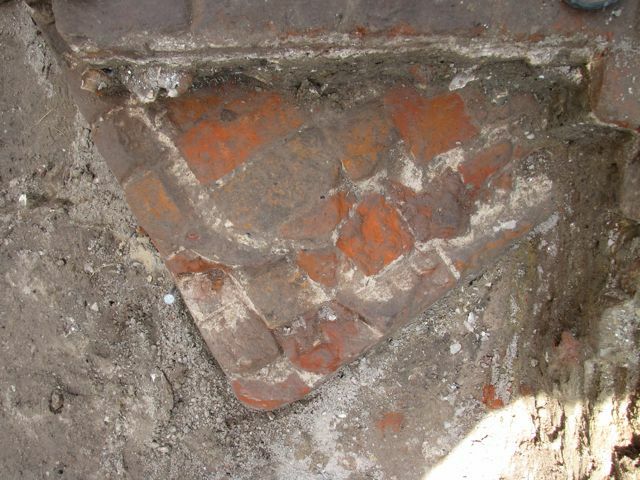 To our delight, they’re also finding a greater quantity of artifacts in this area than in the previous higher strata. 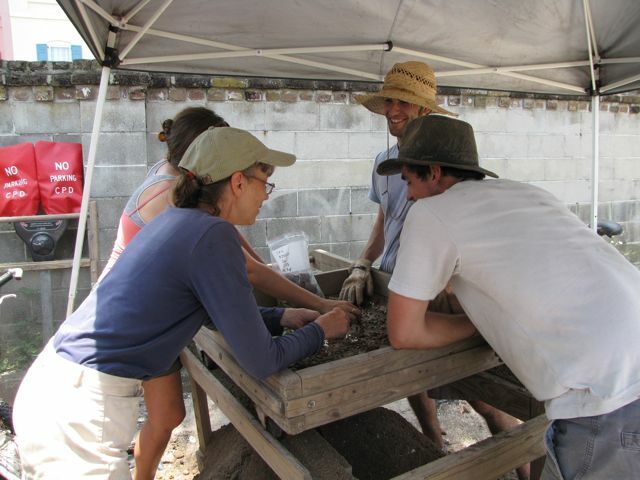 Ron Anthony continued to carefully remove the floor of the excavated unit, passing the dirt on to Martha Zierden and the students at the screens. As a result of all their hard work, we have an slightly improved view of the apex of the redan. 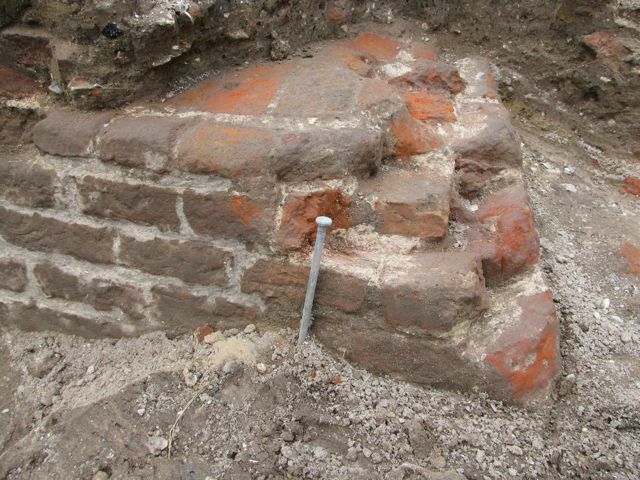 The complex angles of the redan brickwork are finally becoming visible, and over the next couple of weeks we’ll learn much more about the techniques of its construction. 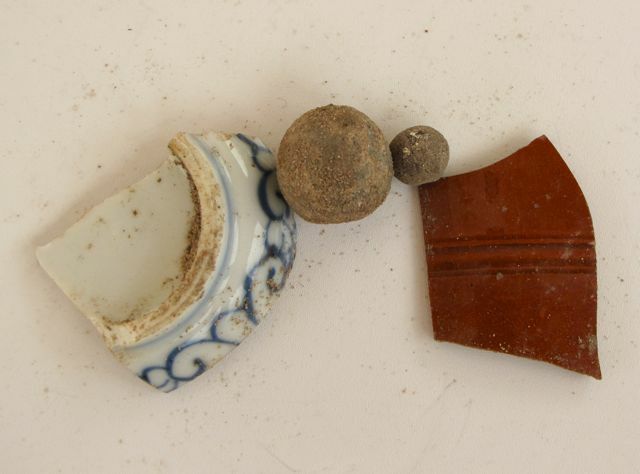 Many interesting artifacts turned up in today’s dirt, all dating from around the middle of the eighteenth century. I’ll just mention a few here. 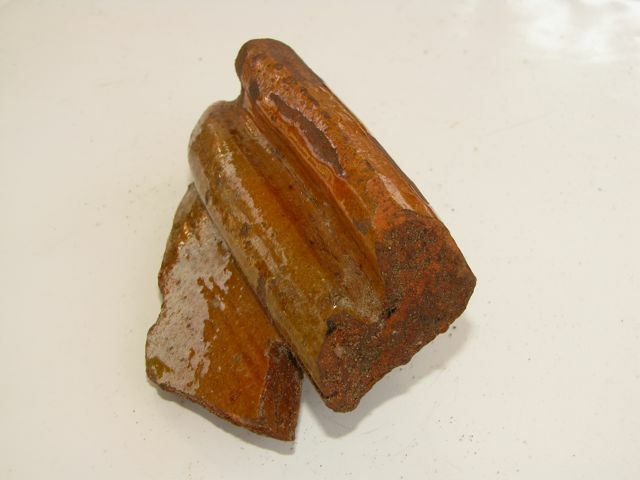 Around mid-day the students found an impressive fragment of a large German cooking vessel. As you can see in the photo below left, this piece represents part of the rim of the vessel, which, Martha tells me, would have looked like a large, shallow dutch oven with small feet. In the center photo below I’ve included two colorful examples of the bounty of ceramics found in today’s levels, along with two sizes of lead musket shot. My favorite artifact of the day, however, is the bottle fragment pictured to the right above. 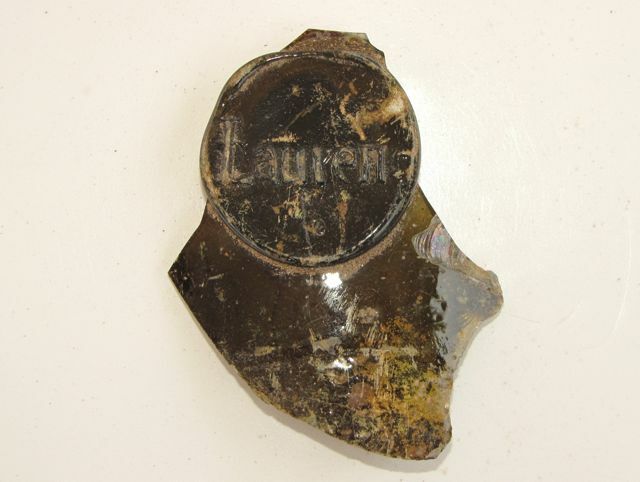 If you look carefully, you can see that the emblem on this hand-blown glass fragment reads “Laurens.” Since this material was found in a layer of dirt representing ca. 1750 to ca. 1780, this bottle may have been created for the wealthy Charleston merchant Henry Laurens (1724–1792). In addition to being a South Carolina legislator, President of the Continental Congress, and the highest ranking American prisoner of war during the Revolution, Laurens amassed a fortune in Charleston through his active import-export business, trading with partners in Europe, Africa, West Indies, and throughout the American colonies. What a find!